I fail, utterly, to understand why people plant Norway Maples by the thousand. Japanese Maples I understand (I’d better, otherwise I am a total hypocrite). But Norways? Now, we have several very large Norways, but I cut every sapling I see. They have poor fall color, rarely have good structure (especially the more modern cultivars), and blah bark. Never mind that havoc they are wreaking as invasive species par excellence! 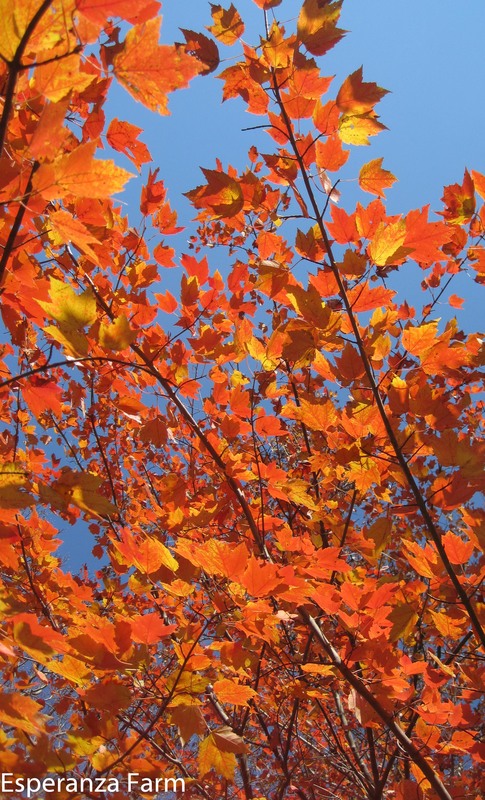 The quandary is made worse by the existence of three outstanding native maples: Sugar, Red, and Silver. All three have gorgeous fall color, the Red and Silver are very tough trees, (the Silver is a common urban street tree in Montreal), both the Red and Silver are fast growing, they have generally good structure (full grown Sugar Maples are classics), elegant bark, and did I mention the fall color…? Here is a shot of our young Red Maple, looking up into it, hardly doing it justice. And this, in a Terrible year for fall color. It is an orange one, some around here are a true scarlet. Each tree has a specific color that they turn each year, the base color is not weather dependent, only the brilliance and length of the show. Your red maple is stunning. It is coppery red, kind of orange, very striking. Ours are true scarlet and just as showy. I agree with your assessment of Norway maples, they are terrible. But I do have to say the Norways get gorgeous color in the fall around here, very rich buttery yellow, deeper than the lighter yellow silver maples. Too bad you are having a poor year for color. I am finding this year to be brilliant and beautiful in northern CT, the first time in a couple years for us. I suspect our poor color is due to being on the top of a hill, the river valley (Farmington) seems to be much better. Actually, the beeches/oaks are quite elegant, it is just the maples. The Norways do get a nice yellow color, I have to admit! silver Maples are a pain, too! they are so weak when they get older that many limbs break and the trees look very bad with all the half broken limbs. It’s funny, I constantly hear that…yet, the ones I know are no more prone to breakage than reds. At least, if they are pruned for balance. They do seem to be prone to growing in an inherently, one-sided, unbalanced fashion which is therefore prone to breaking. So, I suppose, they should be considered only if maintenance pruning/training is part of the regime?